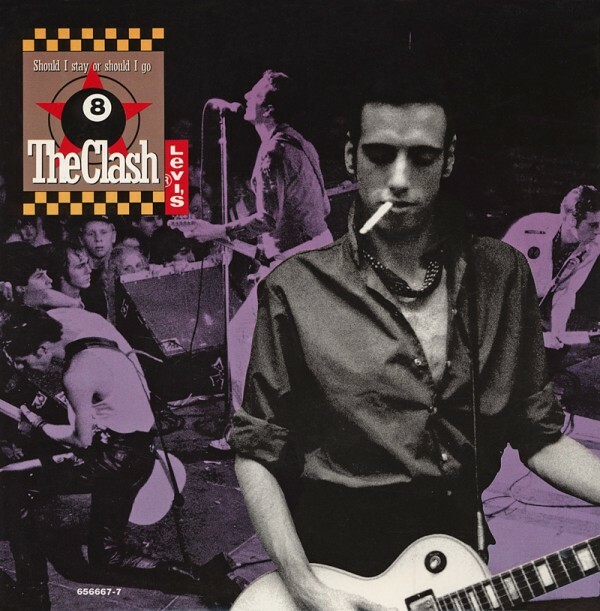 At number 51 in BBC Radio 2’s 100 best guitar riffs is “Should I Stay Or Should I Go?” by The Clash. This song was originally released in June of 1982 and got to number 17 in the Disunited Kingdom and to number 45 in the US singles charts. When it was re-released in 1991 it got to number 1 in the DUK, and remains the band’s only number one single. At number 51 in BBC Radio 2’s list of the 100 best guitar riffs is “Should I Stay Or Should I Go? by The Clash. The song’s Spanish backing vocals were a spur of the moment decision by Joe Strummer, and are sung by him and Joe Ely. In order to translate the lyrics, Strummer got the studio’s tape operator Eddie Garcia to call his mother who was from Ecuador; so in fact the lyrics are Ecuadorian Spanish! Mick Jones takes the lead vocals. 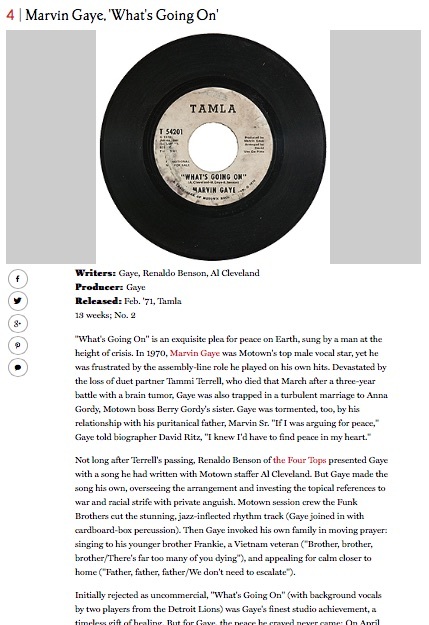 At number 4 in Rolling Stone Magazine’s 500 greatest songs of all time is “What’s Going On” by Marvin Gaye. I have already blogged about this song here when I blogged about the 500 greatest albums, as this song is the title track of the album which came in at number 6 on that list. The song “What’s Going On” was recorded over the summer of 1970 and released as a single in January 1971. It got to number 2 in the US singles charts, but in the Disunited Kingdom it was barely a hit, only getting to number 80 in the singles charts. At number 4 in Rolling Stone Magazine’s ‘500 Greatest Songs of all Time’ is “What’s Going On” by Marvin Gaye. The song was co-written by Gaye, Renaldo Benson (of the Four Tops group) and Al Cleveland. It was inspired by Benson witnessing an anti Vietnam war demonstration on the Berkeley campus in 1969, and discussing the issue with Cleveland. Cleveland went away and wrote the song, but the Four Tops rejected it. When it came to the attention of Gaye he worked on it some more, adding some lyrics and changing the melody. 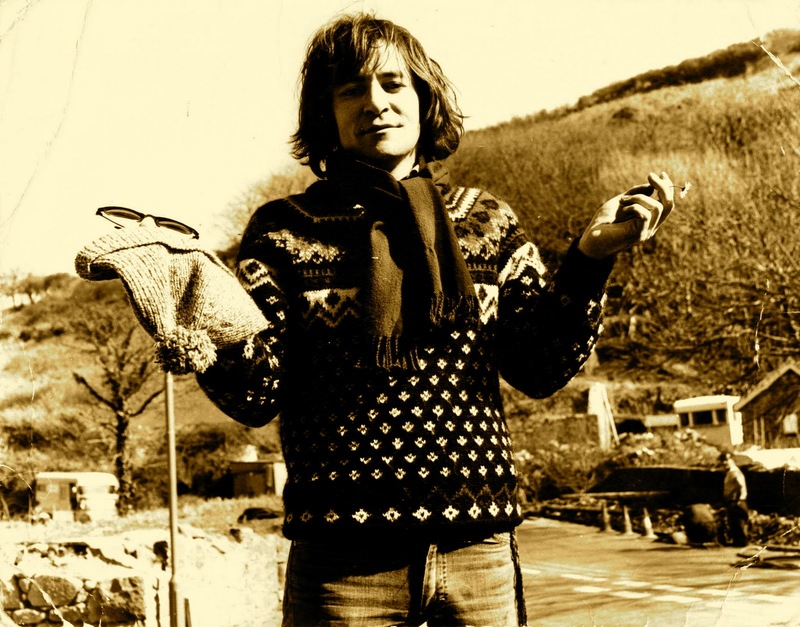 It’s been a while since I posted a Welsh-language song, so today I thought I would share this beautiful song by Meic Stevens – “Lan a Lawr” (Up and Down). There are many things I love about this song, including its simplicity and the enchanting duetting with Heather Jones in the chorus. 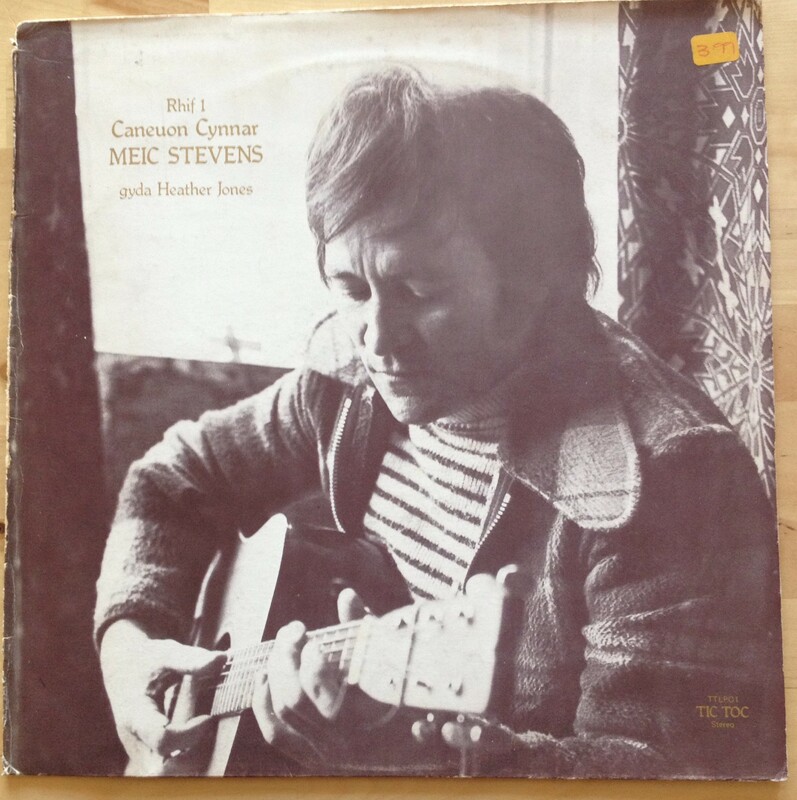 Meic Stevens’ song “Lan a Lawr” (Up and Down) was on his 1979 album “Caneuon Cynnar” (Early Songs). The song appeared on Meic Stevens’ album “Caneuon Cynnar” (Early Songs), which was released in 1979. I bought this album (on vinyl) around that time, here are my photos of the front and back of the album. 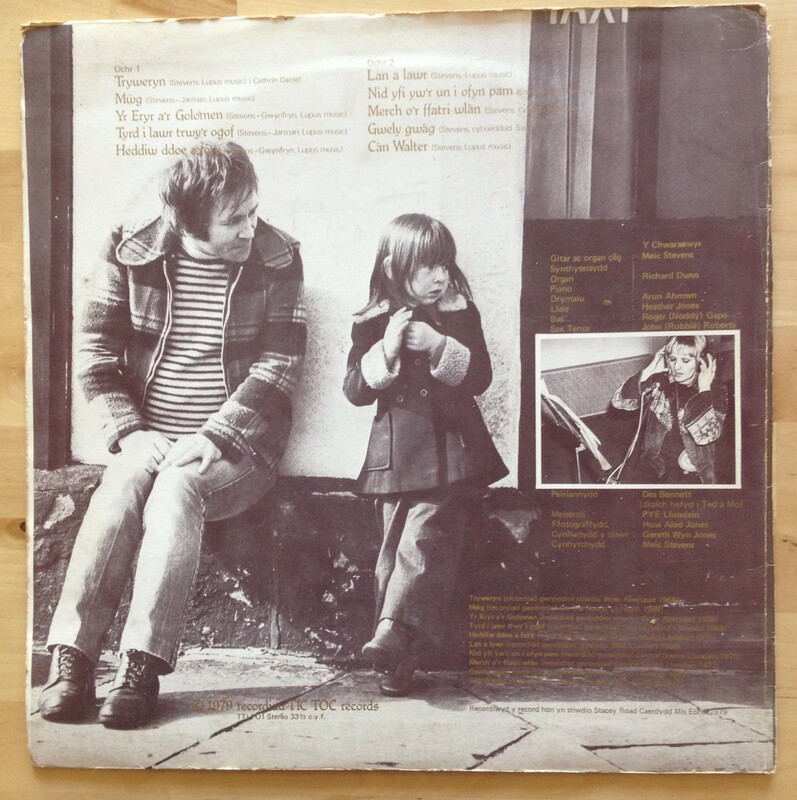 The back cover of “Caneuon Cynnar”. The song is also included on the Meic Stevens compilation “disgwyl rhywbeth gwell i ddod” (expecting something better to come), which I can see is available both at Amazon and on iTunes. According to the sleeve notes on “Caneuon Cynnar”, this song “Lan a Lawr” was first recorded at the BBC studios in Cardiff in 1969. I haven’t been able to find the lyrics anywhere (either online or on the original record), so this is my best attempt to transcribe what Meic Stevens is singing. Although I adore his voice, he doesn’t always have the clearest diction; so I may have made a few mistakes. If you spot any, please let me know and I will correct them. Yn yr awyr, ar y llawr. Mi welaf fam y ddirgel hardd. Aur yr heulwen, dŵr y wawr. Beth yw’r llais mor swynol? Sy’n canu yn y cwm? Mae gen i’r galon drom. Es yn fore tua’r coed. O dan y dail rhyw frenin mawr. A rhwng y cerrig crwn. A seren ar ei bron. Here is my attempt at a translation. If you find any mistakes in my translation (or have suggestions for a better English wording), again please let me know. In the air. On the ground. I see the mother of the handsome secret. Gold of sunlight, water of the dawn. What is the so melodious voice? Which is sining in the valley. I have never heard such a smooth song. I went early to the woods. I saw a fresh river. Under the leaves some kind of important king. I looked in the river. And between the round stones. A white eel like silver. And a star on her breast. Here is a video that I have created of this beautiful song. Enjoy! 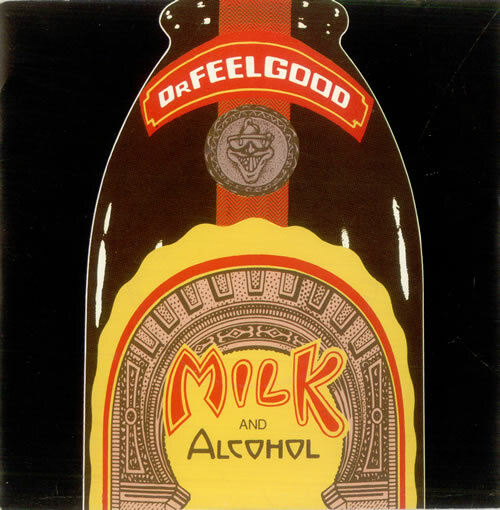 At number 49 in BBC Radio 2’s poll of the 100 greatest guitar riffs (as voted by listeners) is “Milk and Alcohol” by Dr. Feelgood. This song was released in January 1979, and I well remember it from my teenage years. It got to number 10 in the DUK singles charts, and was the band’s biggest hit. At number 49 in BBC Radio 2’s list of the 100 greatest guitar riffs is “Milk and Alcohol” by Dr. Feelgood. The song was written by Nick Lowe and John “Gypie” Mayo. Lowe played in 1970s group Rockville with Dave Edmunds, and subsequently had some solo hits of his own which I will blog about in the future. For me, this song is very reminiscent of teenage parties, and lay somewhere between punk rock and glam rock, neither one nor the other. I liked it at the time, and it does have a great riff. In two days’ time, Venus will be as far to the East of the Sun in the sky as it can be (what is called “maximum Eastern elongation”), so I thought I would take that event as an excuse to summarise what is happening in the sky this month of June. For anyone who has been paying even the most cursory attention to the evening sky over the last several months, Venus has been almost impossible to miss as it has dominated the Western sky after sunset. The only objects which can outshine Venus in the sky are the Moon and the Sun; so when Venus is visible it is the first object to appear as the sky darkens after sunset, or the last object to disappear as the sky lightens before dawn. For the last several months, Venus has been shining with a magnitude of about (it varies because its distance from the Earth is changing and also its phase is changing). This is some eleven times brighter than Sirius, the brightest star in the sky (which has a magnitude of ). It has even outshone Jupiter, the object which has dominated the later evening sky throughout most of the last several months, by a factor of about six. This Saturday (the 6th), it will get as far to the East of the Sun as it can get as seen from Earth, and when it is at greatest Eastern elongation, the angle between looking towards the Sun and towards Venus is about . 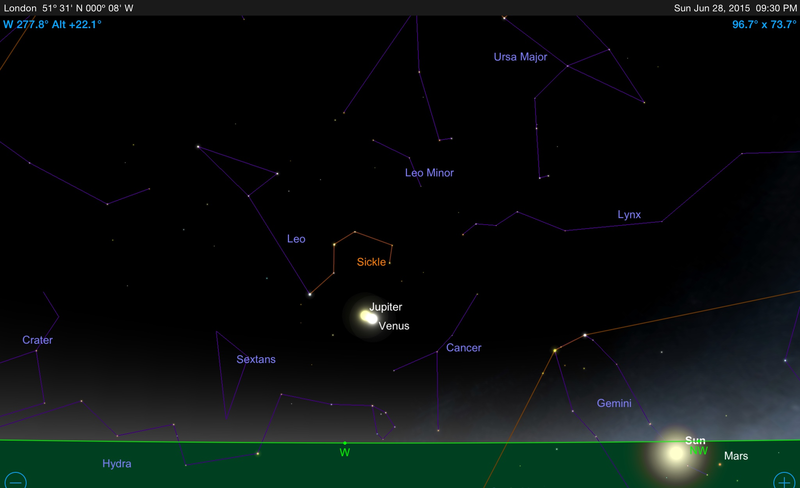 This means that Venus will set some three hours after the Sun. For those who wish to be precise, this particular maximum eastern elongation will occur at 19:13 UT on the 6th, and the angle between the Sun and Venus will be . The figure below shows the orbit of Venus (in red) and that of the Earth (in blue). Both planets orbit the Sun in an anti-clockwise direction if one were to look down on the Solar System from above the Earth’s North pole (which is the convention used, sorry Southern Hemisphere people!). Venus is currently heading towards inferior conjunction (the time when Venus and the Sun lie in a straight line as seen from Earth, and so it is not visible). When it is heading towards inferior conjuction it is to the East of the Sun, and hence sets after the Sun and is seen as an “evening star”. The upcoming inferior conjunction happens on the 15th of August, so just a couple of months away. After passing inferior conjunction, Venus will lie to the West of the Sun as seen from Earth, and so will slowly re-appear as a “morning star”, but you will have to wait for a few weeks after inferior conjunction for this, as initially it will be too close to the Sun and so lost in the glow of dawn. However, long before it reaches inferior conjunction, there is a celestial highlight to look out for, which happens towards the end of June. As June progresses, Venus and Jupiter will appear to get closer and closer together in the sky, and by month’s end there will be a spectacular conjunction of the two brightest planets, something not to be missed. The two diagrams below show Venus and Jupiter on the evening of maximum Eastern elongation (the 6th), and then again at the end of the month. Venus and Jupiter at 21:30 BST (20:30 UT) as seen from London on the 6th of June. 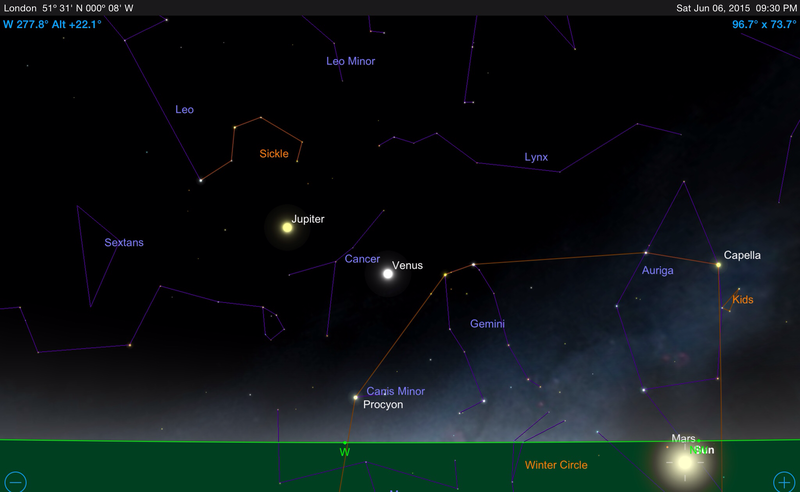 On this evening, Venus will be at “maximum Eastern elongation”. Venus and Jupiter as seen at 21:30 BST (20:30 UT) from London on the 28th of June. The two planets will get even closer over the following few nights, producing a spectacular conjunction of the two brightest planets. The other planet worth looking out for this month is Saturn. Saturn is currently in Libra, but moving into Scorpio. In the middle of June it will be rising at just before 7pm and transiting at just before 11:30pm, so this month is a good time to see it. Saturn in the middle of June, at 21:30 BST (20:30 UT) as seen from London. Saturn is currently in Libra, heading into Scorpio. 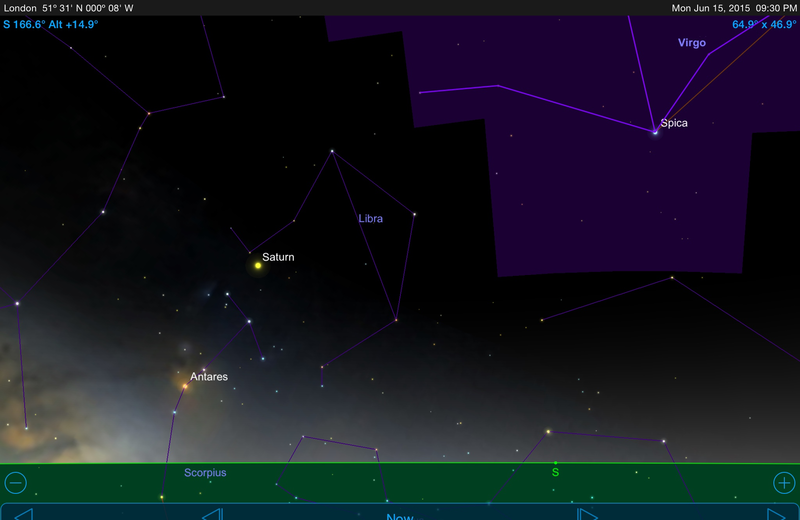 Saturn is not particularly bright at the moment, but you can use the bright stars Antares (in Scorpio) and Spica (in Virgo) to find it; just look at the diagram above. The other highlight of June is, of course, the summer solstice (or winter solstice to people in the Southern Hemisphere). This is, of course, the longest day of the year for people living in the Northern Hemisphere, the moment when the Sun reaches its most northernly point in the sky. This year’s solstice will happen on the 21st of June at 16:38 UT, so at that moment the sky will be directly overhead for a person at the correct longitude on the Tropic of Cancer (for anyone on the Tropic of Cancer the Sun will effectively cast no shadow at midday on that day). Here is south Wales, the days around the Summer Solstice are really long, with the Sun rising at about 4:30am and not setting until nearly 9:30pm. It is my favourite time of the year! At number 5 in Rolling Stone Magazine’s 500 greatest songs is “Respect”. Although this song’s best known version is by Aretha Franklin, which was released in April 1967; it may surprise some to learn that it was actually written by Otis Redding, and released as a single by him in August 1965. As I’ve already mentioned in this blog here, Redding sadly died in December 1967 in a plane crash in Wisconsin; but at least he lived to see the phenomenal success of Franklin’s version of his song. Franklin’s cover got to number 1 in the US and to number 10 in the DUK singles charts. 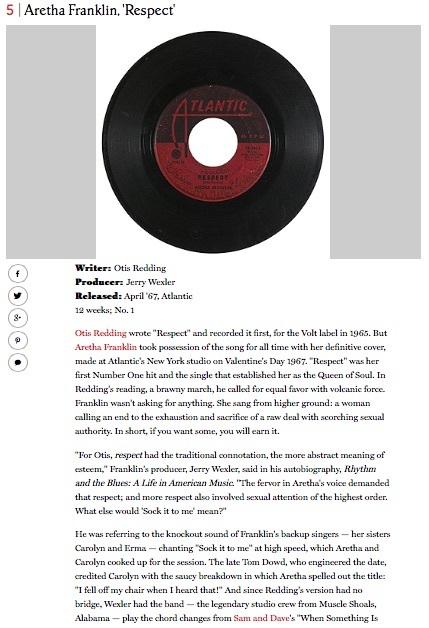 At number 5 in Rolling Stone Magazine’s ‘500 Greatest Songs of all Time’ is “Respect” by Aretha Franklin. There are small lyrical differences between the Redding and Franklin versions of this song; but the main difference is that Franklin was singing the song from a woman’s perspective, demanding respect from her man. Redding, however, had written the song from a very different perspective; a man who liked to womanise when he was on the road with his band, but was demanding faithfulness from his wife. The incredible power and passion of Franklin’s version is one of the reasons this song is at number 5 in this list.